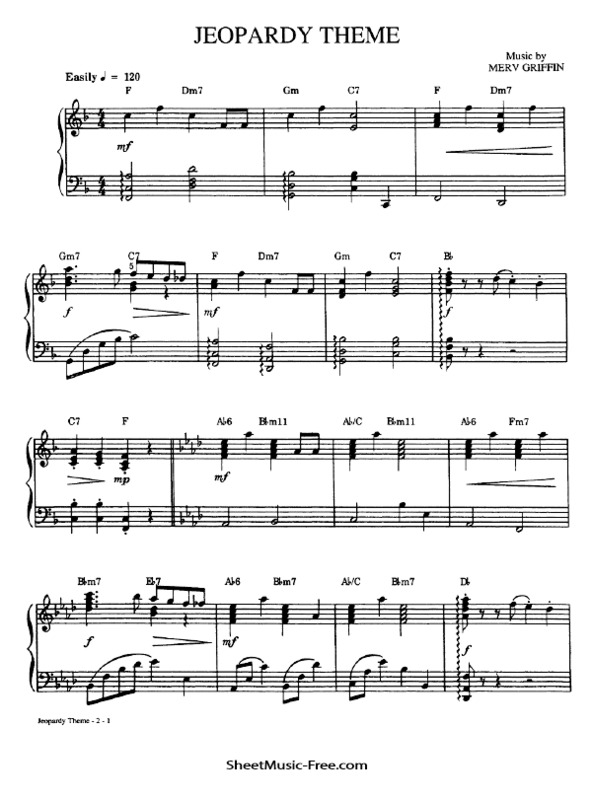 “Jeopardy Sheet Music” by Jeopardy TV Theme, “ Jeopardy Sheet Music” for Piano Solo and Chords , Original key: F Major, number of pages sheet music PDF: 2, Video and Lyrics song Jeopardy Sheet Music. “Jeopardy’” is an American television game show created by Merv Griffin. Jeopardy Sheet Music Jeopardy TV Theme. The show features a quiz competition in which contestants are presented with general knowledge clues in the form of answers, and must phrase their responses in the form of questions. The original daytime version debuted on NBC on March 30, 1964, and aired until January 3, 1975. A weekly nighttime syndicated edition aired from September 1974 to September 1975, and a revival, The All-New Jeopardy!, ran on NBC from October 1978 to March 1979. The current version, a daily syndicated show produced by Sony Pictures Television, premiered on September 10, 1984 and is still airing, making it by far the program’s most successful incarnation. Both NBC versions and the weekly syndicated version were hosted by Art Fleming. Don Pardo served as announcer until 1975, and John Harlan announced for the 1978–79 show. Since its inception, the daily syndicated version has featured Alex Trebek as host and Johnny Gilbert as announcer. With 7,000 episodes aired, the daily syndicated version of Jeopardy! has won a record 31 Daytime Emmy Awards and is the only post-1960 game show to be honored with the Peabody Award. In 2013, the program was ranked No. 45 on TV Guide‘s list of the 60 greatest shows in American television history. Jeopardy! has also gained a worldwide following with regional adaptations in many other countries. The daily syndicated series’ 33rd season premiered on September 12, 2016.